(Newser) – A Tesla sedan with a semi-autonomous autopilot feature rear-ended a fire department truck at 60mph apparently without braking before impact, but police say it's unknown if the autopilot feature was engaged. 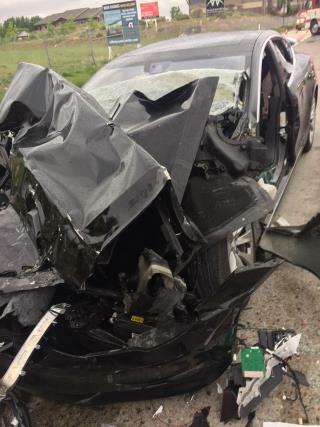 The cause of the Friday evening crash, involving a Tesla Model S and a fire department mechanic truck stopped at a red light, was under investigation, said police in South Jordan, a suburb of Salt Lake City. The crash, in which the Tesla driver was injured, comes as federal safety agencies investigate the performance of Tesla's semi-autonomous driving system. The Tesla's air bags were activated in the crash, South Jordan police Sgt. Samuel Winkler said Saturday. The Tesla's driver suffered a broken right ankle, and the driver of the Unified Fire Authority mechanic truck didn't require treatment, Winkler said. Can I get this repaired under my extended warranty? "it's unknown if the autopilot feature was engaged" It would seem the driver thought autopilot was engaged, when it was not. AKA, pilot error. The car's ECU should be able to shed a definitive light on this. Tech CEOs say self-driving cars will replace regular ones in 5 or 10 years. Programmers laugh like lunatics, & say that self--driving cars will be able to go 100 yards in a driving rainstorm without ramming a tree in 10 years.